Drake has been laying relatively low since his beef with Pusha-T got shut down, but the Toronto rapper seems ready to get back on his album promo cycle. He's unveiled a video for "I'm Upset" — and it sees him reprising his role as Jimmy Brooks. 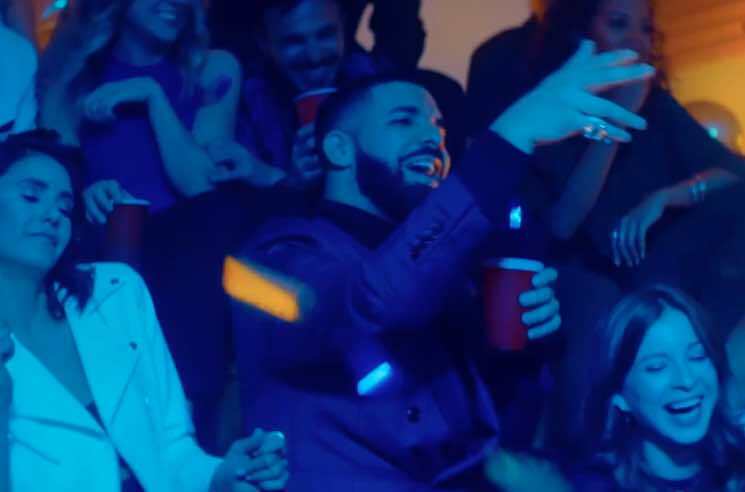 Yes, the new Karena Evans-directed clip gives us the Degrassi: The Next Generation reunion we've all been waiting for. Spinner, Ashley, Paige, Mia, Emma, Manny, Ellie, Craig, Marco, Liberty, Toby and Archie "Snake" Simpson all make their way to the east end Toronto school to party it up with Jimmy. Hell, even Rick (the school shooter who left Drake's character wheelchair-bound) turns up — though the OVO crew quickly run him off school property. Kevin Smith and Jason Mewes also make a notable cameo appearance, reprising their roles as Jay and Silent Bob to sell weed to Mr. Simpson. Watch the ridiculous video for "I'm Upset" at the bottom of the page. Drizzy has also revealed when his Scorpion album is due out. It will arrive on June 29 via OVO Sound. He's also shared what looks like new album artwork for the upcoming release. Check it out below. Drake's previous LP are available on vinyl from Umusic. Pick up Take Care, What a Time to Be Alive (with Future), If You're Reading This It's Too Late and Views.